I am filing this photo under "The Third Time Joe Almost Burned Our House Down." 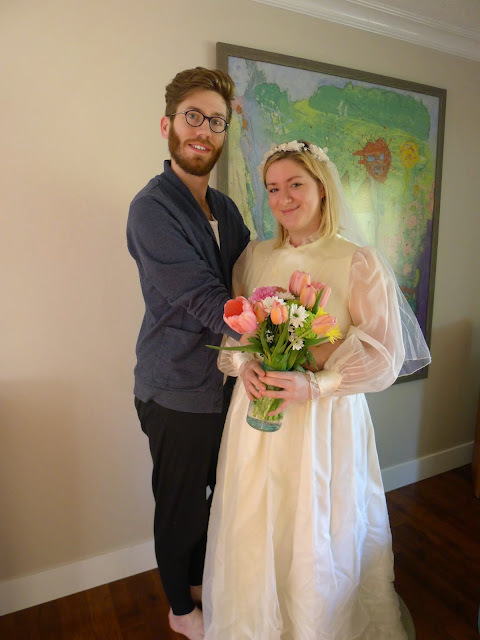 It was our 29th wedding anniversary on Easter Sunday and these two decided to commemorate the event by playing dress-up. We hosted my father-in-law's 80th birthday luncheon on a sunny Sunday afternoon. While we were organizing a group photo, a bald eagle flew overhead. Joe and I have been going on some new hikes this spring. The beauty that surrounds us never ceases to thrill me. One morning Joe was all in a dither because he couldn't find his car keys. He was going to be late to pick up his carpool members. As he ran out of the house he shouted, "You'll have to walk to school today! I am taking your car!" Look what I found on my way out of the driveway. His car keys. In the door of his car. Left there ALL NIGHT! Joe continues to use our driveway as a dry land log sort for his yet-to-be-built outdoor pizza oven. The beauty that is Howe Sound. There is a reason they call this the 'Shining Valley'.